Thought you'd have seen it all by now? Well, you haven't seen it ALL until you've seen the biggest car fins in the world - otherwise known as Max the DareDevil FinMobile. 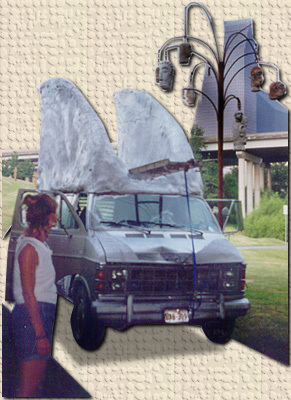 Max is a 1985 Dodge Van with two 6 foot steel frame fins welded to the roof. The fins are covered with foam insulation and sprayed with silver paint. Max's custom grill and front end give him a warm kinda cuddly look - this makes it less terrifying when he is racing towards you in one of his daredevil feats. Max has already been on several road trips and in early February, Tom Kennedy staged his first daredevil extravaganza at The Hangar. Accompanied by the song "Classical Gas," Tom and Max maneuvered through people swinging on swings, rolling bowling balls, bricks, and people jumping rope. The grand finale featured Max driving through a large non-flaming hoop. It was a quite a sight to see!